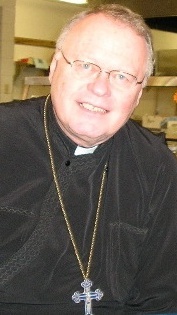 Peter E. Gillquist (July 13, 1938 - July 1, 2012) was an archpriest in the Antiochian Orthodox Christian Archdiocese of North America and retired chairman of the archdiocese's department of missions and evangelism. He was chairman of Conciliar Press (Ben Lomond, California) and the author of numerous books, including Love Is Now, The Physical Side of Being Spiritual and Becoming Orthodox. He also served as project director of the Orthodox Study Bible and from 1997 served as the National Chaplain of the Sigma Alpha Epsilonfraternity.